There are so many ways to travel with pets. Driving, cruise ships, commercial air travel, and if you can afford it, a private jet just for you and your furry friends. 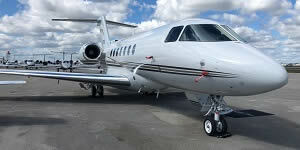 Of course, the cost for private jets are substantially more expensive than the alternatives. Keep in mind, you are reserving the entire plane just for your flight, on your schedule, and you have your very own private pilots. It will certainly be a trip not soon to be forgotten; a special experience for both you and your best friends. Skipping the lines and the bag checks will certainly alleviate a lot of the stress, but this does come at a cost which can run from a few thousand on shorter intrastate trips to tens of thousands across the country, or even hundreds of thousands to cross the ocean. Every trip is different depending on the duration of the flight, how many passengers are flying and the size and number of pets accompanying you. We have partnered with Air Charter Advisors, a Wyvern* Broker, to assist with your flight, and they are happy to offer very competitive rates while still making the safety of you and your pet a top priority. Below are a few example routes, and, if they fit your budget – fill in a few details to request a free quote. *Wyvern is a globally recognized seal of aviation safety and only the top 2% of air charter companies in the world belong to this elite group. 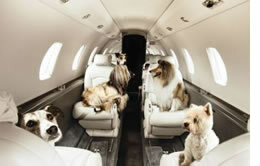 Why charter a private jet for you and your pet? There are many different reasons for chartering a private aircraft to fly with your pet instead of flying on a commercial airline. Size - In today's world of shrinking airline seats, it is getting more and more difficult to take your pet in the cabin of the aircraft. If your best friend is over 15 pounds or more than 12 inches tall, then it will probably have to fly in the cargo hold (depending on the airline). This section of the cargo is pressurized and temperature controlled, but you might be concerned about putting your pet in the cargo hold of a commercial airline. Summer/Winter Embargoes - During the summer when temperature exceeds 84 degrees F on the runway, many airlines will not accept a pet as checked baggage or as cargo. During the colder months, airlines will not transport your pet if the temperatures fall below 45 degrees F.
Number of Pets Traveling with You - Most airlines limit you to one pet per passenger in the cabin. If you have multiple pets or the pets are traveling unaccompanied, then they will need to travel as checked baggage or as cargo. Breed of Pet - Many airlines will not accept snub nose breeds such as Persian cats, Bulldogs, Pugs and Shih-Tzus in the cargo hold as they may develop breathing problems at high altitudes. Immigration Requirements - Many countries like the UK will only allow pets to fly commercially as manifest (air) cargo and not in the cabin. What can a pet owner do to avoid having to fly their pet in the hold of the aircraft? Pet Travel has partnered with Air Charter Advisors to provide you with instant access to over 10,000 private jets and simple, pay-as-you-go air charter services with no contracts, no hidden charges, and no membership fees. It's as simple as fly anywhere - anytime. 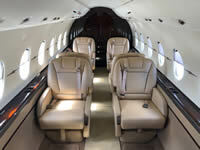 Why arrange a jet charter? You and your pet will fly without the distractions of other pets or passengers. You choose a schedule that meets your needs. You can fly from an airport of your choosing. You choose your type of aircraft. 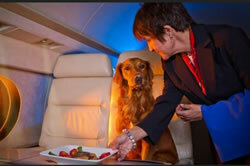 You choose your in-flight catering menu for you and your pet. Your pet always travels in the cabin with you. 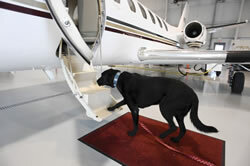 Jets are luxurious and designed to service the needs of you and your pet. No crowded airports or long TSA lines. No size or breed restrictions. Traveling with your pet is permitted all year long - no summer heat embargo. Fill out this simple quotation form for a free quote. We look forward to providing you and your pet the ultimate experience in flight.